Comments Off on Bruins Lose Tight Affair in Port! Bruins Lose Tight Affair in Port! The Uxbridge Bruins playing with two players out of the lineup due to injuries lost another when their leading scorer was ejected for a hit from behind call, lost in a very entertaining game 2-1 to the Mojacks this afternoon. 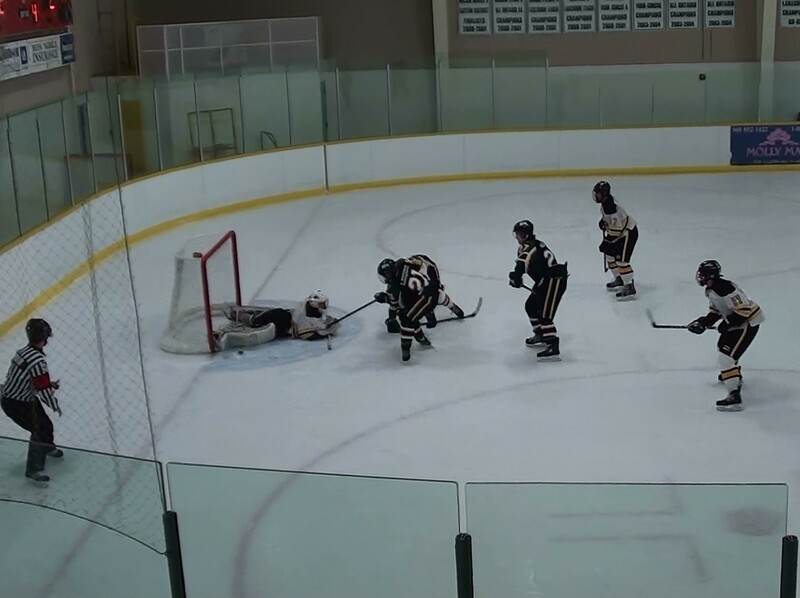 Port Perry opened the scoring in the second on the power play but the Bruins would tie it on Carter Vahey’s wrist shot from the point after a face off win by Daryle Thomson to Adam Bartholomew and his pass to Vahey and subsequent shot, floated through a crowd into the top corner glove side. The Mojacks restored the lead and that is the way it ended with no scoring in the third period. The Bruins next home game is Fri Dec.5th vs Clarington and then on Dec. 12th it is Teddy Bear Toss night. Comments Off on Knights Throw Scare At Bruins! Knights Throw Scare At Bruins! (Photo John Yates) Marco Mastrangelo gets the winning goal in a 4-2 win over North Kawartha Knights. The Knights scored two late goals to cut the lead to 3-2 but Uxbridge held on with an empty net goal by Shane Smith. Jake Jooston improve to 5 wins and 1 loss on the season. The Bruins first Teddy Bear Toss is Fri. Dec.12th when they host the Georgina Ice at 7:45pm. Comments Off on Bruins take Lakefield in See-Saw Battle! Bruins take Lakefield in See-Saw Battle! Photo: Brandon Francey comes up huge on a breakaway save late in the game preserving a 5-4 win! Marco Mastrangelo scores the winner as Jarett Smith’s pass hit his skate and then he tapped it in, his second of the game in a come from behind win, 5-4 over the Chiefs. 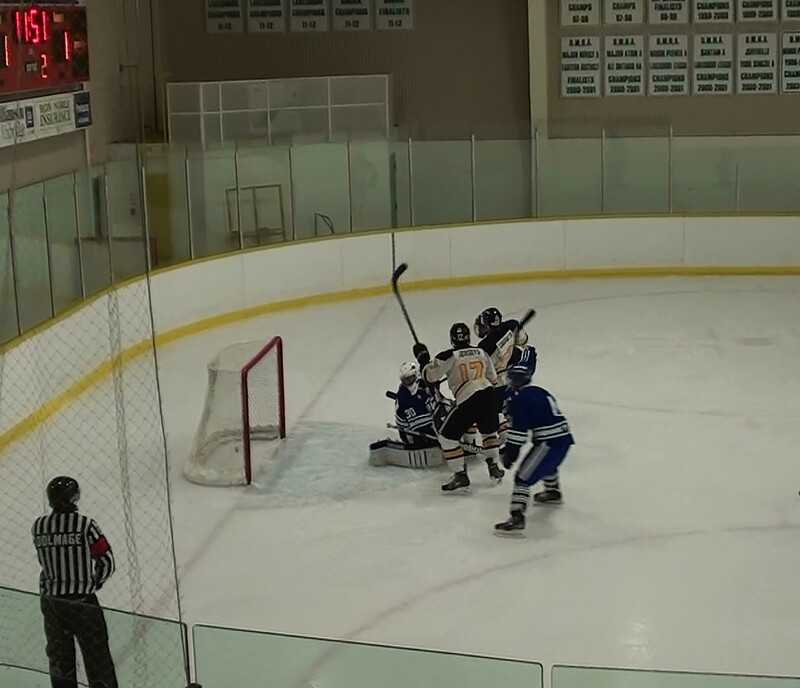 Jordan Nesbitt had tied the game just 18 seconds earlier after Lakefield had wiped out a 3-1 Bruins lead. also scoring for the Bruins was Conner Evans and Jarret Smith. Next home game is Fri. Nov.28th vs North Kawartha Knights on Williamson Chrysler Care A Van Night. Bring a food item or cash donation to the Bruins game to help our local food bank. Dec.12th is Teddy Bear Toss night! Comments Off on Bruins post win in Sutton! Bruins post win in Sutton! In Sutton tonight the Bruins spotted the Ice a 1-0 lead in the first period, but would tie it on Marco Mastrangelo’s give and go with Jarett Smith. Conner Evans added an assist as well. Then in the second the flood gates opened as Tyson Eastgate was sent in on a breakaway by Mastrangelo for a 2-1 lead. Shane Smith then stripped the puck off an Ice player firing a shot over the goalies glove, to up it to 3-1 Bruins. Just 8 seconds later Jordan Nessbit got the puck from a face-off win by Dylan Locke as he fired a five hole shot ending the night for the Ice’s goalie Lennon Gowan. Daryle Thomson took a pass from Carter Vahey as he fought to keep the puck in the Ice zone and Thomson’s wrister went in off the post. 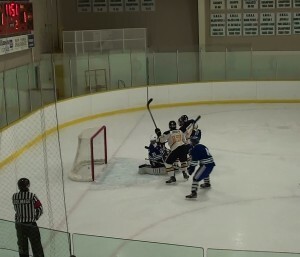 Jake Jooston made a great save in the Bruins net and Nesbitt cleared the puck to Alex Siblock in the neutral zone, passing off to Robert Freckleton and he put in his own rebound to close off the Scoring. Uxbridge Host North Kawartha Fri. Nov.28th at the Bear Den and will be having their first annual Teddy Bear toss on Dec.12th. 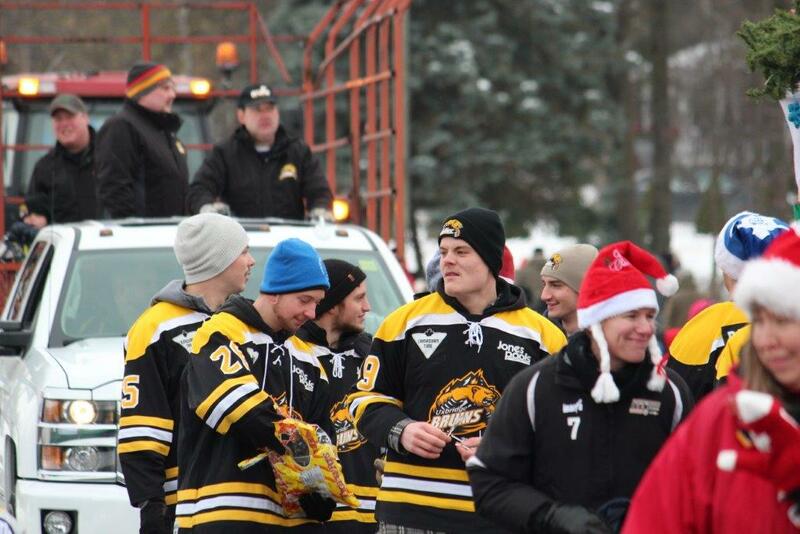 Comments Off on Uxbridge Bruins at the Santa Claus Parade! 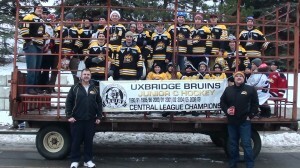 Uxbridge Bruins at the Santa Claus Parade! Members of the Bruins enjoy a day at the parade handing out candy, along with members of Uxbridge Minor Hockey and house league players. (Photo: John Yates) Marco Mastrangelo scores the second of 4 on the night and Tyson Eastgate gets 3 in a 7-3 win tonight over the Georgina Ice. The Bruins play a rematch Sunday Nov.23rd in Sutton at 3:20pm. Thier next home game is Fri Nov.28th when they host the North Kawartha Knights. On Dec. 12th The Bruins hold their first Teddy Bear toss in support of the Uxbridge Toy Drive. Comments Off on Bruins Announce Roster Moves! The Uxbridge Bruins have added Uxbridge natives Todd Winder, a forward who comes from Aurora Jr. A and Liam Knoll a defencenen from Elliot Lake. The Bruins would like to thank Matt Pollard for his service in an Uxbridge uniform as he moves up to play in Elliot Lake. Comments Off on Bruins Were Flying in Clarington Tonight! 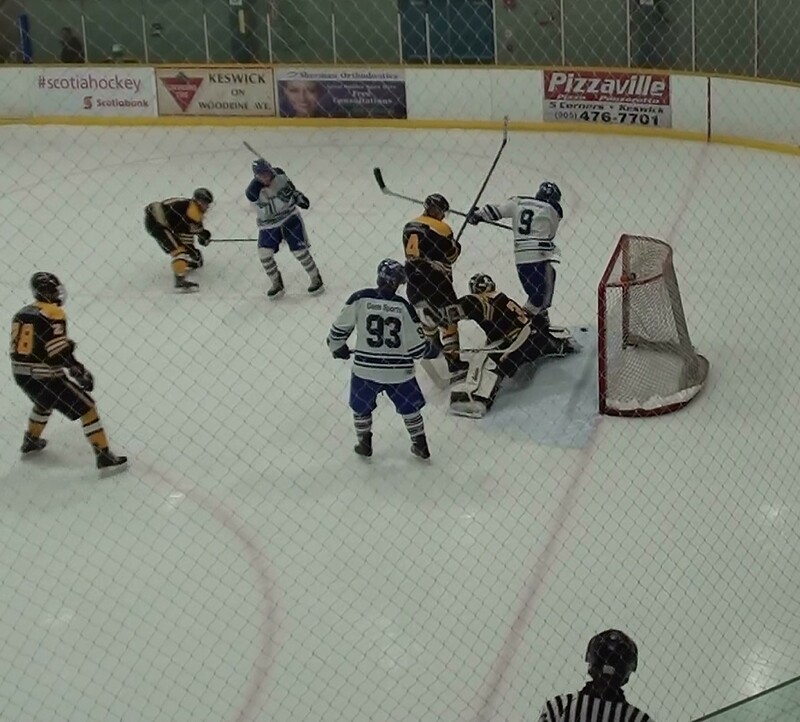 Bruins Were Flying in Clarington Tonight! The Bruins leading scorer Marco Mastrangelo got his team off to a strong start with an unassisted goal in the first period at Clarington tonight. Tyson Eastgate added two in the second for a 3-0 lead and after the Eagles got thier first goal Todd Winder and Conner Evans closed off the scoring for a 5-1 win. Brandon Francey picked up the win in goal. Dec 12th is the Bruins first annual Teddy Bear toss after they score thier first goal of the game as part of the Uxbridge Toy Drive. Comments Off on Mojacks come from behind in win over Bruins! Mojacks come from behind in win over Bruins! (Photo) Branden Francey makes a pad save against a Mojack player. 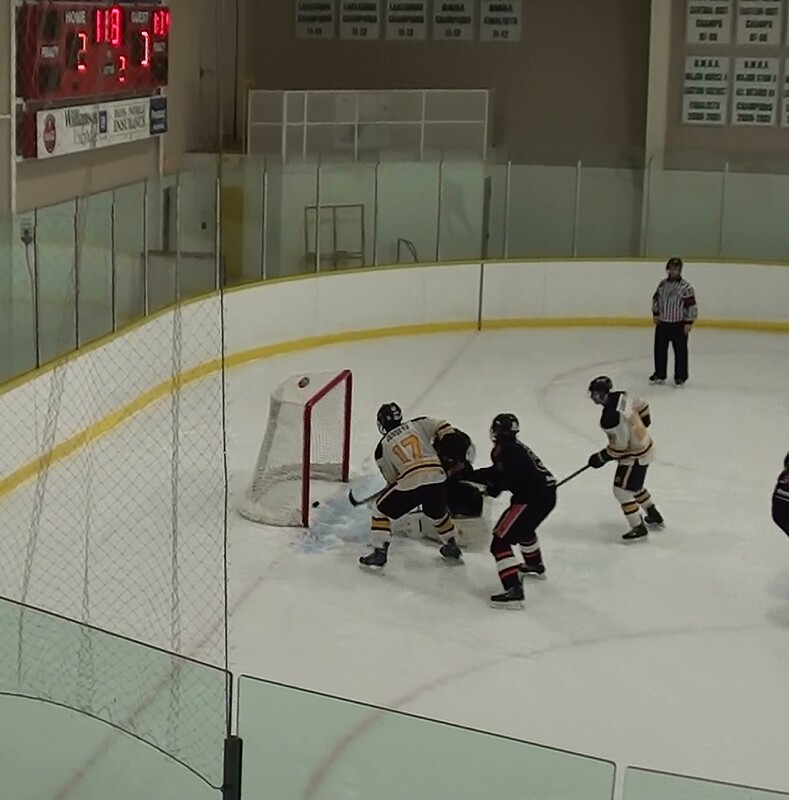 A scoreless first period resulted in the Uxbridge Bruins trying for a better start in the second and Marco Mastrangelo intercepted a pass at the Mojacks blueline and fired a hard wrist shot that hit the back crossbar, falling into the net. Jarett Smith and Jordan Nesbitt picked up assists on the play. Next it was recently signed Todd Winder an Uxbridge product getting his first Junior C Goal for a 2-0 lead from Shane Smith and Patrick Bolahood. The Bruins thought they had made it 3-0 but the net was knocked off on the play which resulted in a delay of game penalty to the Mojacks goalie. Port would score at 2 seconds left in the second and tie it in the third to force OT, which resulted in no goals. The Mojacks scored on one of their shots and the Bruins did not on their shootout chances. Uxbridge host the Georgina Ice Fri. Nov.21st at the Bear Den. Comments Off on Uxbridge Bruins 1st Annual Teddy Bear Toss! Uxbridge Bruins 1st Annual Teddy Bear Toss! On Dec 12th the Bruins will be hosting their first Teddy Bear toss in an effort to collect Teddy Bears for the Christmas Toy Drive. 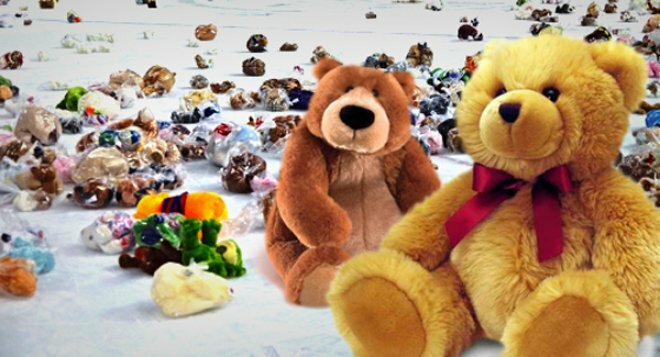 After the Bruins score their first goal of the game we ask our fans to throw their new store bought Teddy Bears wrapped in clear plastic bags onto the ice surface. There will be Teddy Bears for sale at the Arena for anyone wishing to purchase one for this worthy cause. Help the Uxbridge Bruins put a smile on a every child’s face in the Township of Uxbridge this Christmas.